First established in 1906, the Victrola brand has been a mainstay in the audio world having made a name for themselves with an iconic sense of design and a dedication to producing producing affordable, high quality audio equipment. 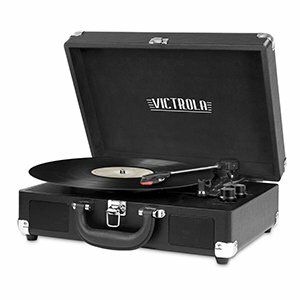 As far as entry level turntables go, you will be hard pushed to find one better looking than the Victrola Vintage. The whole device is built into what is effectively a suitcase, and is available in a whole host of cutesy, 50s feeling colors and styles. When we say ‘effectively a suitcase’, we mean it: you can close the lid, turn it on its side, and no one would be any the wiser as to whether or not you were packing for a trip or taking your turntable to a party. The inside of the suitcase is also nicely designed. The turntable itself takes up, as you would expect, the vast majority of the available space, but the rest is made use of extremely efficiently. You have a dial to select your input source, a dial to control power and volume, and then your inputs themselves. None of these look exceptional, but they are finished in a matte black which helps to keep your eyes focused on the colorful exterior rather than what’s going on elsewhere. Unlike many of the turntables on offer at this price range, Victrola have included a Bluetooth option with their Vintage model. This adds a good deal of flexibility when it comes to playback, and means you should be able to stream from any Bluetooth enabled source (such as pretty much any smartphone made after the invention of pixels) at up to 33 feet away. The inputs on offer will more than suffice for your day to day playback requirements. Sporting the standard 3.5mm aux in, you will be able to connect to all manner of devices for your listening pleasure. If the mood strikes, why not take things to the next level by plugging your headphones in for a little bit of solo action. Let’s kick off with the Bluetooth response. All in all, and considering that this is an entry level product, the streaming covers all bases and works surprisingly well. In our extensive testing, we did not encounter any issues with distortion, lag, or other such problems. The range, too, proved to extend beyond the advertised 33 feet and meant that we could stream without issue from pretty much anywhere in the house. The other input options are more than ample for the kind of use cases which are targeted by this device. The audio quality was more than sufficient for the price range, however if you prefer a heavy bass response you will, of course, wish to look elsewhere. Whilst this problem could be mitigated to some extent by the use of high quality headphones or earbuds, this is more of an entry level sound quality than will satisfy one of the more ardent audiophiles. The Victrola Vintage 3-Speed is a great looking product which manages to perform well for its price-range and overall position in the market. Its standout feature is, of course, its portability and the customization options which the suitcase exterior afford.